Exploring the unknown requires a lot of time, patience, and bright ideas. And a fat wallet doesn't hurt, either. Such is the case with dark energy. Many universities and government agencies have launched efforts to discover the nature of dark energy, using everything from small ground-based telescopes to expensive new satellites. They will use varying techniques to probe the history of the universe's expansion, with different levels of precision and accuracy. All of the projects are based on bright ideas by astronomers, physicists, and engineers, and all will require years to complete. In some ways, the projects are in a competition. The first project to discover the nature of dark energy will earn kudos and awards today and a spot in the history books tomorrow. Overall, though, the projects complement each other, like the different European expeditions to the Americas in the 1500s or the robotic and manned missions to the Moon of the 1960s and '70s. It's possible that the answer will come only from combining the results of several projects. And even if one project discovers the nature of dark energy, many questions about its evolution and its future effects on the universe won't be answered without long-term study. Several projects are designed to plot the expansion rate of the universe by measuring supernovae at different distances from Earth, which we see as they existed at different times in the history of the universe. These measurements will reveal how the expansion rate of the universe has changed over time, which in turn will reveal the influence of dark energy at different epochs. Other projects will measure the distances between galaxies at different times in the history of the universe for the remnants of sound waves created in the Big Bang. And still others will look for "clumpiness" in the universe by studying the shapes of many different galaxies over the history of the universe. Some projects will combine two or more of these techniques to provide a more complete picture of the history of the universe and the role of dark energy. BOSS: Baryon Oscillation Spectroscopic Survey. A consortium of astronomers will use the 2.5-meter (100-inch) Sloan Digital Sky Survey telescope at Apache Point, New Mexico, to measure the imprint of sound waves from the Big Bang at distances of up to 10 billion light-years. An earlier Sloan study found some evidence of these waves in the distribution of galaxies. 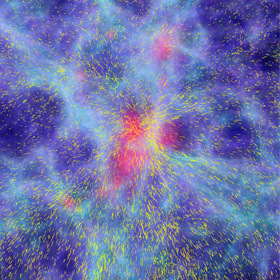 DES: Dark Energy Survey. A new 570-megapixel camera and related instrumentation for the 4-meter (158-inch) Blanco telescope in South America will measure the distances to remote galaxies and supernovae and use weak gravitational lensing to probe the universe's expansion history. WFMOS: Wide-Field Multi-Object Spectrograph. Another project that will measure the imprint of sound waves, it is a new instrument planned for the Gemini North telescope in Hawaii or another large telescope. LSST: Large Synoptic Survey Telescope. Scheduled for first light no earlier than 2020, this 8.4-meter (27.7-foot) telescope will photograph the entire sky every three nights. Its images and other data will reveal supernovae and plot the distribution of galaxies over the last few billion years. WFIRST: Wide-Field Infrared Survey Telescope. NASA is studying designs for a large space telescope to study dark energy, exoplanets, and other topics. The spacecraft would study the universe at infrared wavelengths, which are blocked by Earth’s atmosphere. The mission would not launch until well after 2020. Euclid. A European satellite will use weak gravitational lensing and baryon acoustic oscillations to probe the distribution of dark matter, which will help determine the nature of dark energy. Mission scientists also hope to expand the mission to measure the distances to supernovae. The mission, which has received final approval, will launch no earlier than 2020.